According to the Centers For Disease Control and Prevention (CDC), approximately 2,000 employees daily receive medical treatment for a work-related eye injury. Of these 2,000 injuries, roughly one third are serious enough to require emergency medical treatment, and 100 of them result in at least one day of lost work. From industrial factories and construction sites to offices and labs, eye injuries can occur in practically any industry or workplace. Failing to provide workers with the appropriate personal protection equipment (PPE) could place them at a higher risk for eye injuries — not to mention the fact that PPE is mandated by the Occupational Safety and Health Administration (OSHA). “Eye and face protection must be provided whenever necessary to protect against chemical, environmental, and radiological hazards or mechanical irritants,” wrote OSHA on their website. The most common cause of work-related eye injury is from flying debris. When small piece of metal, glass or even plastic shoots out from underneath a tool with enough velocity, it may become embedded into a worker’s eye. This is why it’s important for workers to wear the appropriate safety glasses when operating power tools and heavy machinery. Failing to wear durable safety glasses while operating power tools or heavy machinery can result in small pieces of debris flying towards the operator, placing him or her at risk for eye injury. Of course, injury to the eye may also occur when acidic or otherwise harmful chemicals are splashed into a worker’s face. 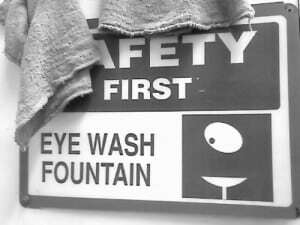 Workplaces with potentially harmful/dangerous chemicals should set up emergency eyewash stations in all hazardous areas. Employees must also be trained to know exactly where these stations are located and how to operate them. 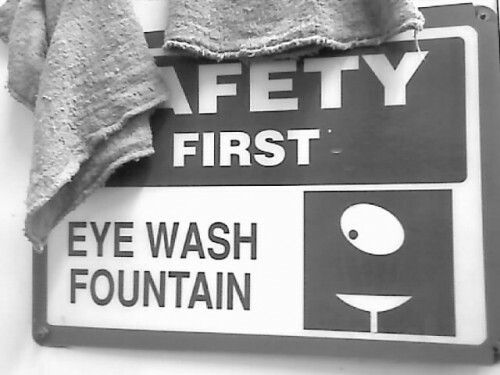 Many employers set up emergency eyewash stations but fail to train their employees on how to use them; thus, failing to meet the rules set forth by OSHA. Provide workers with protective eyewear. Properly maintain power tools and heavy machinery to reduce the risk of mechanical failure. Train workers on how to use an emergency eyewash station. Dust and chemical eye protective eyewear should create an air-tight seal around the wearer’s eyes. Protective eyewear used by another employee should be disinfected before it’s worn. Workers who wear prescription glasses, contacts or any other form of corrective lens should also wear the appropriate protective eyewear.